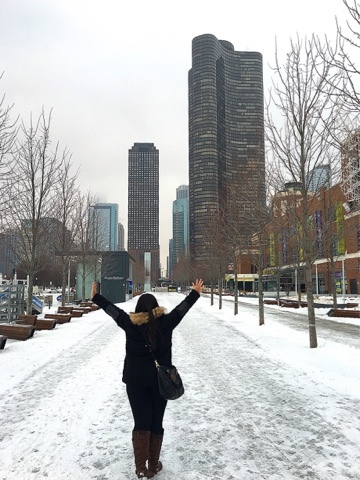 I've been overly excited to visit Chicago for a few years now and I finally made it! Some people, namely Californians, were shocked I would visit during the winter. Not only did I grow up in a city with all four seasons, I lived in Detroit and in the Pacific Northwest so the cold doesn't scare me one bit. In fact, living in California the past 3.5 years, winter has been lacking in my life and wanted it back! So yes, what better place than Chicago for that right? Smith & Wollensky Steakhouse: This place was a recommendation of a family member that loves steak so it was a must-try. My favorite thing about the place was the view. 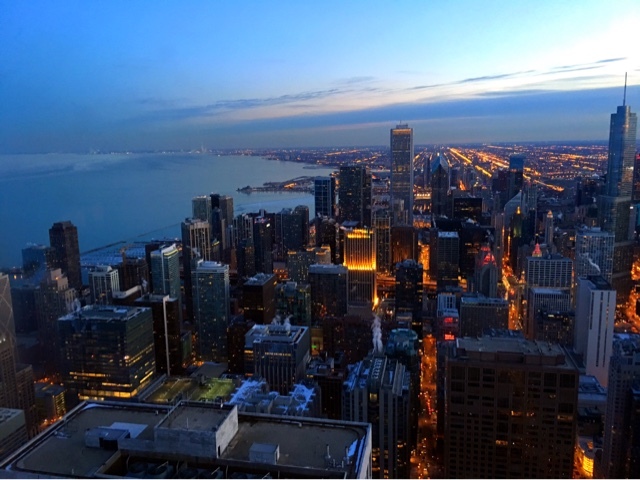 I had a window-seat overlooking the glistening river and the Magnificent Mile during sunset which was absolutely gorgeous! Their food and service are great but very similar to Morton's Steakhouse or Fleming's Steakhouse as a comparison. So if you're looking for something truly local, this may not be it. Brunch: Yes, this brunch spot is called Brunch (genius much?). It was high on my list and for good reason. 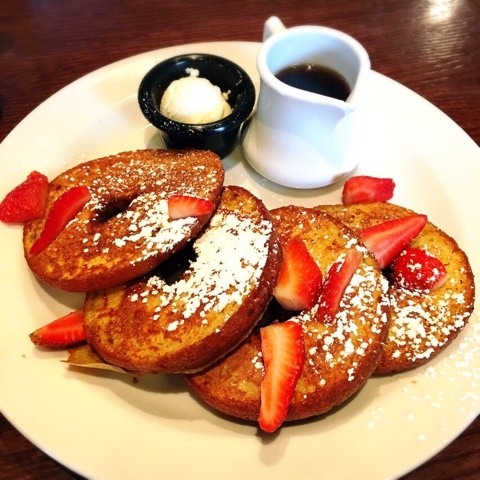 S'mores French Toast, Donut French Toast, Blueberry Muffin Tops, Butternut Benny Florentine, Chi-Town Skillet and the list goes on. Need I say more though? I ended up sharing the Blueberry Muffin Tops as an appetizer and enjoyed the Donut French Toast with some Intelligentsia (Chicago local coffee shop) coffee. My mouth is watering as I type this! The atmosphere was great and so was the service - so much so I almost went back! 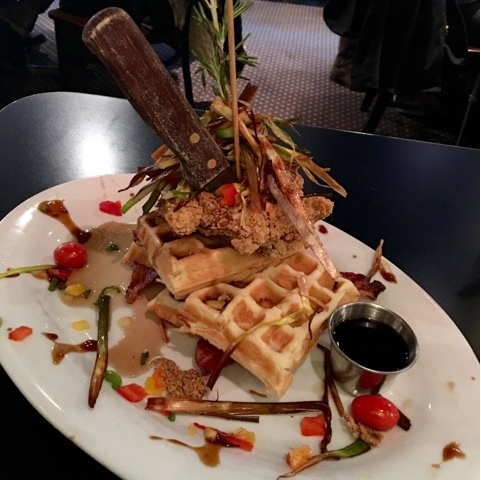 Hash House A Go-Go: I had no idea this was a small chain restaurant but I don't really care, it was such an experience! The Concierge was raving about it and the menu was intriguing so off I went! Their portions are insane. All of their dishes could probably feed a small village. Speaking of portions, it's one of the restaurants that the TV show "Man VS Food" was on! Their Sage Fried Chicken & Waffles is their staple so of course I had to get that. The picture speaks for itself but goodness gracious it was a lot! The portion size aside though, they don't slack on the flavor or quality. The chicken was cooked perfectly and the waffles were divine. Highly recommend! 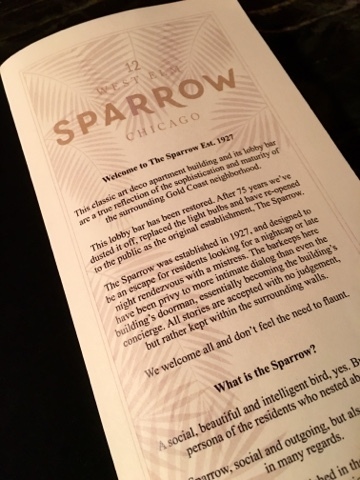 Sparrow: This place is arguably my favorite place out of all the Chicago places I ate or had drinks at. Sparrow is a lobby bar that's been restored into an art deco, 1930's vibe - think The Grand Budapest Hotel movie. I stumbled across this joint in the Gold Coast since my hotel was in the neighborhood and went back twice during my stay. The hotel-themed bar is vibrant yet calm with charming decorations; wall full of hotel keys, restroom doors as hotel room doors, a vintage phone booth (that actually works! ), etc. Their cocktails were to die for, specifically the "Hotel National" - a pineapple concoction that's not too sour, not too sweet. If you are of age, I can't recommend this place enough. Sable Kitchen: I almost didn't include this restaurant but my dessert got so much engagement over on my Instagram, I figured it deserved a mention. 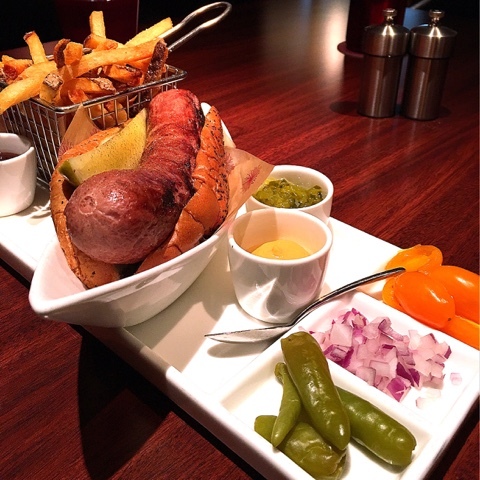 Sable Kitchen is part of the Palomar Hotel on Magnificent Mile. Their food was ok at best but they made up for that with the Churro Ice Cream Sandwich. 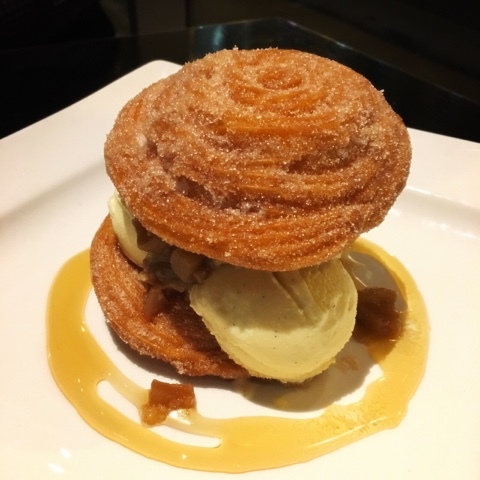 It was two pieces of piping hot churros with homemade vanilla bean ice cream, yum! 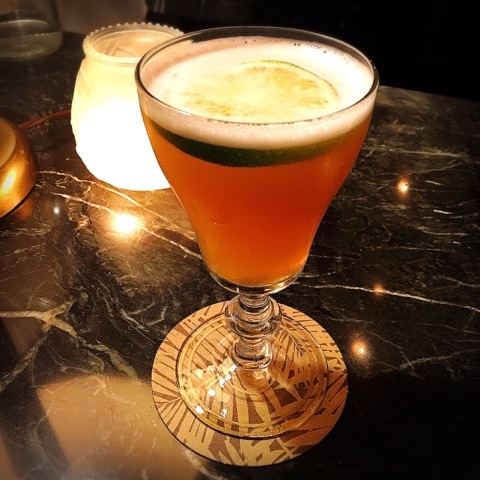 Allium: This restaurant is inside the Four Seasons Hotel on Magnificent Mile. I did quite a bit of research as to where I should go for a good Chicago-style hot dog. Allium was on quite a bit of lists and since it was in such a convenient location, I decided to go. Their all beef hot dog and pickle on a moist bun with optional peppers, tomatoes, onions and other goodness for toppings. It was so delicious! Their fries were out of this world, too! Definitely a great spot for lunch! 360 Chicago: Thank you to everyone that suggested I visit the 360 Chicago Observatory! It's not an obvious observatory like for example, the Space Needle in Seattle or the CN Tower in Toronto. It's on the 94th floor of a building formerly known as the John Hancock building. I went right as the sun was setting and words cannot describe the beauty that ensued before my eyes. Pictures will say more than what I could ever describe! It's definitely a must when visiting Chicago. A quick tip - buy tickets beforehand so you can go through the fast lane instead of lining up. When I was there, the line to buy tickets was about 50+ people long! 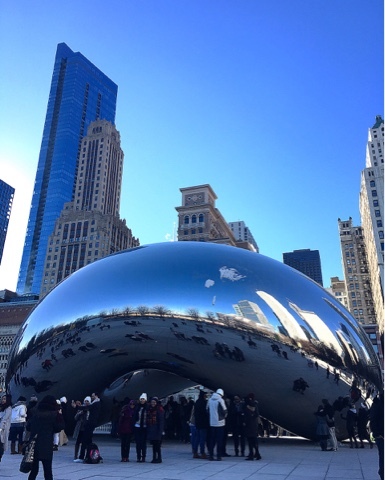 The Giant Bean & Millennium Park: One of the first places I visited during my trip. The famous Giant Bean plopped in the middle of the city inside Millennium Park. I knew it was big but you don't quite know how big until you're standing by it! After some photos under the bean, I explored Millennium Park. They had 2 ice skating rinks, a water park, an outdoor theatre and some other fun areas throughout the park. Again, it must be busy and hopping when it's warmer but I love how they take advantage of the winter by opening ice skating rinks! Museum of Contemporary Art: This was a last minute decision that I'm glad I made. Such a huge contrast from the Chicago Institute of Art, this museum was full of Pop Art exhibits. 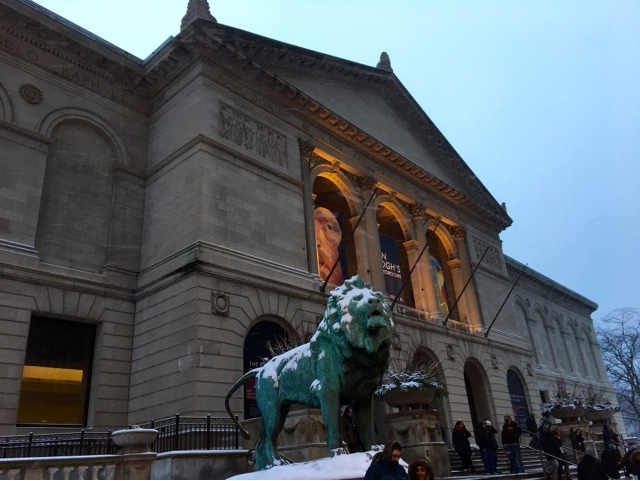 Unlike the Chicago Institute of Art, you don't need an entire day to get some quality time here. The Pop Art pieces were so much fun and some are completely 'out there', I loved every second of it! Chicago Institute of Art: The only thing I wish I had during my visit is more time and maybe some Crocs. This museum is one of the best I've had the pleasure of visiting. The array of pieces they have are outstanding and very engaging. They had a special exhibit, Van Gogh's Bedroom which I unfortunately didn't get to see but I hear is breath-taking. The line to get into that exhibit was over 90 minutes long and I didn't want to waste my time in line. My favorite exhibit was the Greek Art although several others are close contenders; Asian Pacific Art, Miniature Art, American Folk Art and the list goes on. 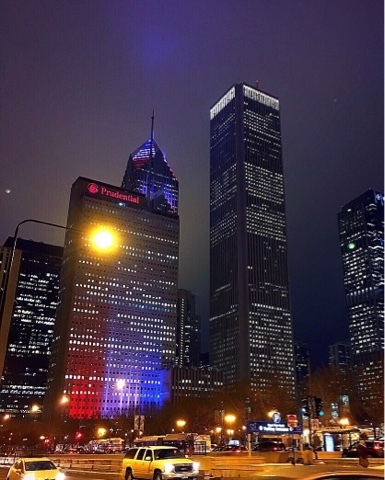 It's no surprise they're ranked #1 on TripAdvisor amongst Things To Do in Chicago! 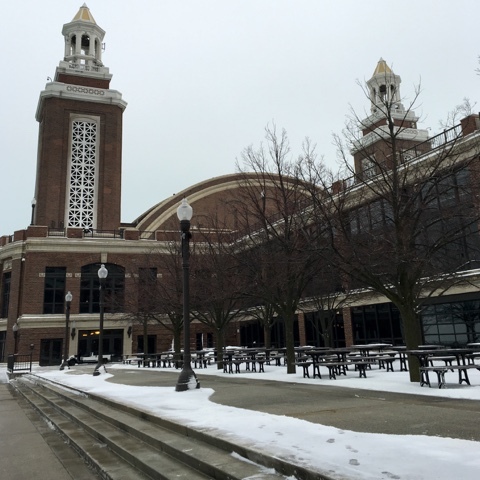 Navy Pier: I'm not sure my visit warrants a quality review seeing as the Navy Pier probably isn't the hottest place to visit during winter. When I went, it was completely desolate seeing as it was only 17 degrees (-8.3 celcius) out. Lake Michigan was frozen over and while the Pier itself was open, only a few shops were open. It's the biggest pier I have ever visited. I couldn't believe how grand it was! I can only assume it's a terrific place when the weather is a bit warmer. They'll have a bigger and better ferris wheel finished and available to ride this summer, how exciting! 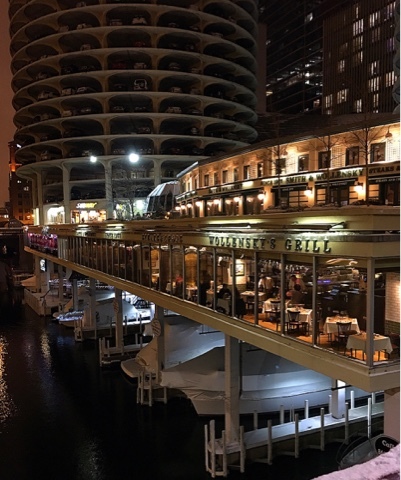 Magnificent Mile: If shopping is your thing, Magnificent Mile is your place! I'm fortunate enough to live in Los Angeles where there's more than enough shopping so I tend not to seek shopping experiences whilst traveling. However, I was still impressed with the lineup! Every store you can think of is along Magnificent Mile. That's it for now, friends! I hope to return when it's warmer weather so I can experience some of the things that were closed for the winter. Thank you to everyone that sent me recommendations, I appreciate them so much! Yes, I live in California and Chicago sounds a bit strange. But, I wouldn't mind going and restaurant hop all day. Everything looks great!